Servers and Cabinets from LodgeCraft help fill one with a bit of nostalgia while displaying either Grandma's antique china or the some of the beautiful local pottery you treasure. 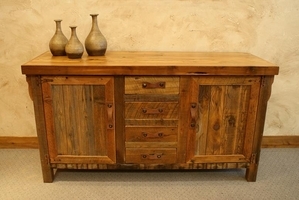 We feature all kinds of styles and shapes of cabinets and servers, including hardwood imported servers, pine cabinets and servers from Montana, oak and cherry cabinets from Oregon and hickory servers made in Indiana. That's right, we sell furniture from all over the USA, the world and even a selection of pine, alder, and reclaimed wood servers made right here in our NW Montana workshop.